Chennai is a hot city. We are only in the month of March but the weather is becoming unbearable. The daily two hour power cuts are a pain, the only thing that preserves my sanity is living near the beach. My home has good cross ventilation so life has not reached a crisis point as yet. One thing this heat is good for is making yeasted doughs. In this temperature, fermentation is a breeze, excuse the pun! All one needs to do is to mix the ingredients, knead well and within the next 30 minutes, the dough is ready for shaping. I love working with yeast. There’s something soothing about combining flour, sugar, yeast and liquid. Then the workout begins, the more you pound, pummel and stretch the dough, the softer and more malleable it becomes. Once the dough has completed the first rising, shaping is the next fun activity. I had to make doughnuts as a friend was coming over for a visit. 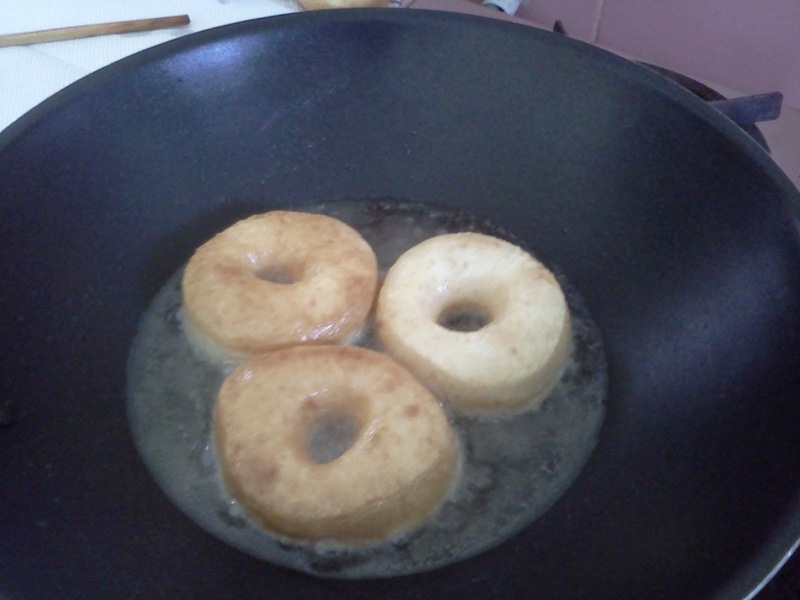 My usual doughnut recipe needs an egg for enrichment, but as this is the Lenten season, I omitted it. 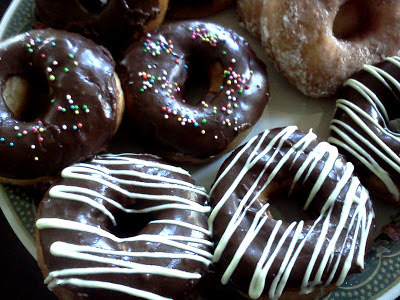 These doughnuts are good only on the day they are made. Sift flour onto a worktop, mix in sugar, salt and yeast. Make a well in the centre. Warm the milk and water to blood heat, mix in butter and when well combined, pour into the well. Knead, first using fingertips, then as the flour is drawn into the liquid, use the heel of the palm. Don’t worry if the dough is quite sticky at this point, it will tighten up as it gets kneaded. On the other hand, if the dough is dry, add in a tablespoon of warm water at a time and keep kneading till the dough is smooth, springy and soft. Knead for about 5-10 minutes. 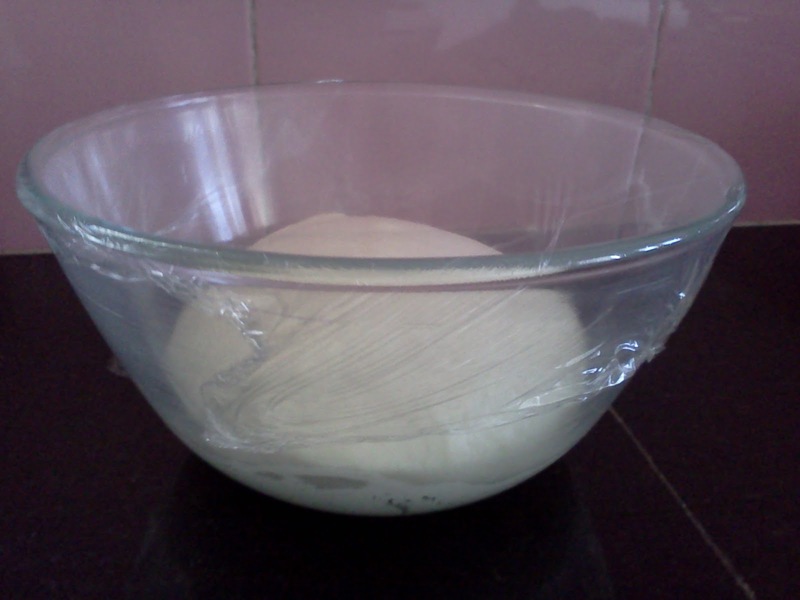 Form the dough into a ball, place in a 2 litre greased bowl. Cover with cling wrap. Keep aside for about 30 minutes or till well risen and doubled in size. Remove the cling wrap, punch down the dough and knead briefly. Lightly dust the worktop with flour, place the dough on it, dust the top of the dough lightly with a little more flour and roll it out gently to 1/2 inch thickness. Cut out circles using a 3” cutter. Cut out holes from the centres and place doughnuts on a sheet of plastic. Cover with a second sheet of plastic and leave undisturbed for another 20 minutes or till doubled in size. Heat a pan with oil, slide 2 or 3 doughnuts carefully into the oil. Turn them over when they reach a deep golden colour. When the second side is also done, scoop them out onto kitchen towels to drain excess oil. Mix chocolate and butter. Add the icing sugar, a little at a time and then the essence. Add a little hot water at a time to thin it down. 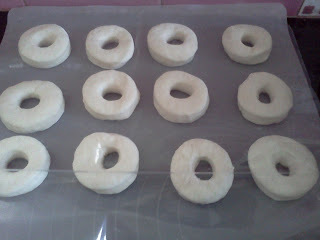 Dip each doughnut into the glaze and place on a wire rack. Decorate with sprinkles or use melted white chocolate to pipe lines across the doughnut. Hello Ma'am , I made these doughnuts and they were so delicious. Just perfect. Thank you for sharing this recipe. Hi Aqua24, so glad to know that the recipe has worked for you. Cheers. Hi! I will certainly try this recipe. Thanks for sharing. Just wanted to check what is instant yeast? Is it the fresh yeast available with bakeries? Hi Rakhee, when you use instant yeast, there is no need to activate it, you add it directly into the flour. I guess you could pick up fresh yeast at the Nilgiris stores. Remember to use double the quantity of yeast in that case.